Strategies that Michael Hester implanted when he launched Beacon Communications continue to serve the now NSCA president well in semi-retirement. The story of Beacon Communication begins not when Michael Hester founded it in 1998 or when he became NSCA president in 2014, but when he was a roadie touring with The Who in the late 1960s. In 1966 an impressionable Hester, who wouldn’t graduate high school until 1969, was pals with a guy who was in Dimensions, what he calls “the biggest local band in Houston” at the time. Dimensions, which was later renamed The Sound Investment, was so big that when headline acts including The Who, Janice Joplin, The Beach Boys, Buffalo Springfield and Crosby Stills Nash and Young came to town the local band would open for them not just in Houston but in other Texas shows. So Hester’s first job in the pro AV industry from 1966 to 1969 involved working the soundboard, traveling with and experiencing characters like Keith Moon, John Entwistle, Roger Daltrey, Pete Townsend, Joplin, Neil Young and Stephen Stills. “From that, I’ve always been into sound and am into it now,” Hester says. Minus the mind-blowing anecdotes (and he has some great ones), a lot of folks who run integration firms had similar starts in the industry in that they were guided by passion for audio or video. Many of those stories don’t end well, particularly when the passion for technology isn’t supported by commitment to the business side of the operation. Hester doesn’t fit that stereotype. As much as he gravitates to audio, business and leadership has always interested him. In the army after high school, Hester attended and finished at the top of a leadership program. Once out of the military, he worked full-time while earning his bachelor’s degree in communications from the University of Houston. Then he sought a career in the AV industry. Where else? Authorized Dealer Partnerships: Rapid City, S.D. ; Casper, Wyo. Every job Hester has had since then has been somehow connected to Rauland-Borg. He worked for distributors of its hospital and school communication and safety solution products and, for a time, directly for Rauland-Borg. His roles almost always involved meeting with and getting a window into how the integration firms that were Rauland-Borg dealers ticked. That experience likely gave Hester an edge when he developed his own integration business, says NSCA executive director Chuck Wilson. Getting a window into the good and bad practices of integration firms influenced his strategies when he got a chance to launch his own in 1998. “It was interesting visiting all those firms,” he recalls. “You’d walk into a place and you could take the feeling of the place. You walk in the front door, and there was usually a young lady at the front desk who had her head down. “She didn’t look up. She wasn’t happy. The place was a mess. There’s a bunch of equipment stacked up in the corner, leaning against the wall. It didn’t feel good. What I gleaned from that, what I wanted us to be was completely different. The Columbine High School shooting massacre took place when Beacon Communications was in its infancy. About a year prior, Rauland-Borg had encouraged Hester to move to Colorado and launch an integration firm to fill a void in the Denver market. Being a Rauland-Borg dealer, more so than relationships with other manufacturers, defines what an integration firm is. 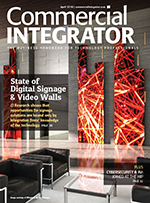 In most cases, the integrator is the only authorized distributor for a certain area. Meanwhile, the nature of its product line gives integrators a strong foothold in health care and education markets.